Your choice of aircraft matters greatly when flying to Hawaii. 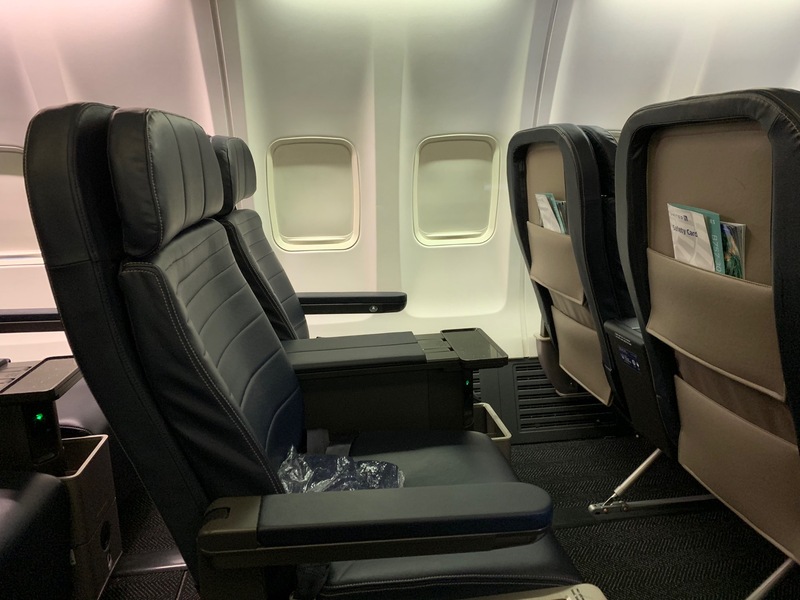 While widebodies will generally result in premium cabin lie-flat seating on American, Delta, Hawaiian, and United, narrowbody aircraft usually feature only recliner seats. Since I reviewed my Hawaiian Airlines flight on the way out, I thought I would review my United inbound flight as well. 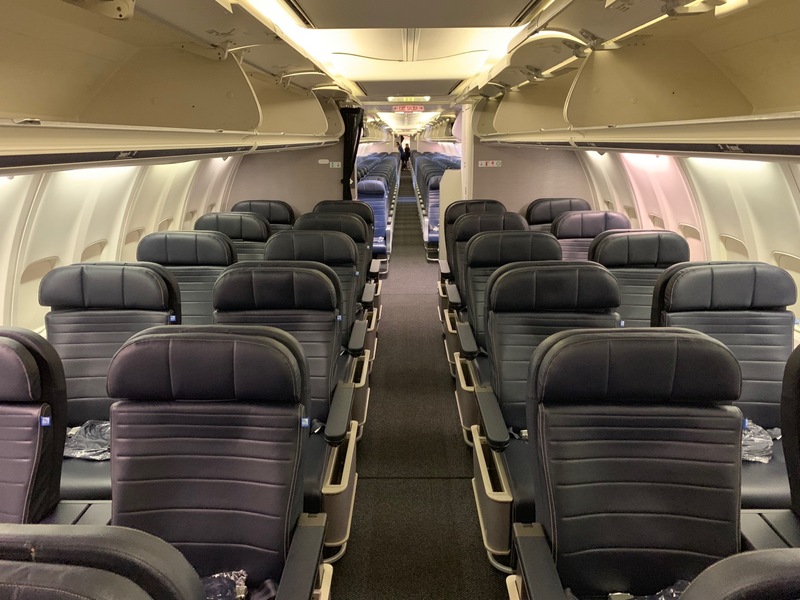 While United’s 757-300 does not offer lie-flat seating, it does offer United’s latest refresh to domestic first class. Originally, I had booked a redeye flight home, which would have been on a 737-800 with similar non lie-flat seats. But when I completed my work a bit earlier than expected in Honolulu, I looked toward options that would get me home in time to sleep in my own bed. I noticed UA1231, which was originally supposed to leave at 8:00 AM but had still not left five hours later. The app would not confirm me on this delayed flight, but a quick call to United landed me on it. I headed from the Hyatt Regency to the airport at about 1:15 PM and made it in 15 minutes. The airport was like a ghost town at this time of day, and the PreCheck line was deserted. While proceeding to the gate, I received notification that my upgrade had cleared. While it was “only” a 757-300, the upgrade would certainly make the return trip more pleasant. Boarding began at 2:10 PM. The United gate area is currently under renovation so I did not even bother to head up to the United Club. I was first to board and the FAs seemed unprepared for passengers. I waited at the jetbridge for about 30 seconds before stepping on to the plane. I’m not sure where everyone was behind me, but I still had time to snap a few pictures of the first class cabin. United recently refreshed the seating in its 757-300s. The older, bulkier first class seats were replaced with seats that offer more easily accessible power ports, a built-in stand for tablets or phones on the tray table, and more personal storage. The seats also have an articulating seat pan (meaning instead of only the seatback sliding back, the seat cushion also moves forward to give the illusion of greater recline). While not my favorite seat, it is a comfortable seat and I actually managed to sleep for most of the flight. Although originally assigned an aisle seat, the window seat passenger never showed up. I moved over to the window and a passenger from economy class was brought up to take 2E. United offers no pillows in domestic first class (except on premium transcon flights) and only a thin blue blanket. This flight was originally catered as a breakfast flight and had to be re-catered before we took off. After we departed, the pursuer took lunch orders, which were a choice of apple cider-glazed chicken or vegetarian pasta. I opted for the chicken. One thing I love about United over Hawaiian is that United uses large-sized, nicely-scented hot towels in first class. Hawaiian did not offer towels of any kind on my flight over. Next came warmed mixed nuts with choice of beverage. I appreciated that there were macadamia nuts in the mix, which only happens on flights catered in Honolulu. Although the purser initially indicated that no mai tais were loaded, he eventually found one and offered it to me without the usual pineapple and cherry stick. The main course arrived on one tray and included a side salad, pretzel roll, and the cider-glazed chicken breast with bulgar and yucca sticks. These yucca sticks reminded me of the tamale chicken breasts United used to serve in premium cabins, which were extremely tasty. But I must admit this meal was also very tasty. The chicken was only lightly glazed and I could taste more thyme than apple cider. Furthermore, the chicken was moist and tender, but not at all rubbery. Dessert included an ice cream sundae. The ice cream was rock hard and took a good 20-minutes to melt: it would have been good to pull it out early. Usually United will serve a warm chocolate chip cookie prior to landing. Now I may have slept through it if it turned out to be a midflight snack, but I awoke about 90 minutes prior to landing and there were no cookies. I was a bit concerned that the service would be surly on the flight. The purser took orders briskly, did not address passengers by name, and was very quick to let me know there were no mai tais boarded. Here are some pictures from out the window, something I always like to share on Hawaii flights. I particularly love that people are surfing/paddling right next to the airport. That looks to be a cool spot for plane spotting! With the exception of the macadamia nuts and mai tais, there wasn’t anything Hawaiian about this flight. Still, it represented typical United; a decent meal, comfortable seat, and good service. If you’re looking for those special Hawaiian touches, fly Hawaiian, but I walked away from United flight perfectly satisfied. when does united fly lie flat seats to Hawaii? LAX and SFO also have flat beds but only 1 or 2 of the 5x daily have it. Their 777 Denver to Honolulu has them. It’s really only worth it on the longer flights anyway, since by the time dinner is done there is only a few more hours to west coast. We’ve flown the lay flat from KOA to Denver and only my son slept well on the lay flat seats, it was just too small a plane with too many people up talking in first class, unfortunately. The food and service were excellent though. You’re really living on the edge with that battery life. United flies flat beds to Hawaii from select east coast airports. Missing world bulgar. Fixed it. Thanks. Looks like the other B word. Barley. Bulger is chopped up wheat. That appears to be an auto-correct thing. I’ve fixed it. Seeing military planes is my favorite part about HNL, last time I saw F15s, F22s, B2, KC 135, C17 upon landing. Sit on the left side of the plane for your best chance. What this review excels at, Matthew, is balanced perspective. As a frequent traveler on United, you knew what to expect on both your original 737 equipment type and the extended length 757-300 you were able to be accommodated on (although ending early gave you the option for a quick cab ride to the Kahala to have afternoon tea and a sunset libation, and you declined!!) . Rather than write a review that compared it to Singapore Suites or an LAX/NY transcon, it was reviewed with the understanding that it is a domestic first class product — much like you would see LAX/ORD or ATL/SEA. What it seems we expect from such a product in 2019 is a clean and well maintained seat and surroundings, working IFE either in seat or streaming, decent WIFI speed if available, crew service that meets the standard set by the airline for that route, and, weather permitting, an on-time arrival. Your review covered all of those areas always — never whining about what your product didn’t have nor should have based on that flight — something that I often read from less experienced travelers and/or self proclaimed travel review experts. Well done. Matthew – I always struggle to take quality pics out the window on departure/landing, but your picture quality is great. What camera do you use? I was a flight attendant for United and have served the apple cider chicken , yes it is good! I’m glad someone read my mind and transcribed it. I flew on a CO 753 years ago but U remember the plane being bright and spotless. This UA plane looked drab and outdated, perhaps because of the awful lighting and the age of the plane. I feel the same way. I miss their Moscow Mule by Crafthouse Cocktails. That was an all-around win, considering that Crafthouse is a brand from a local award-winning bartender in Chicago, and a high quality cocktail to boot. Interesting. United’s catering out of HNL looks pretty good. Certainly better looking than Delta of late. Does United not use tablecloths on the tray table? PLEASE ADD A SUBSCRIPTION BY EMAIL OPTION. It is there. Should pop up as you scroll down the homepage. If not, try opening in private mode. I’ll work on adding a sign-up link directly to website. This particular “United First” cabin would be called “Premium Economy” on many airlines in East Asia. Service is indeed a couple of notches above a typical “Premium Economy” but arguably on par with that on China Airlines.